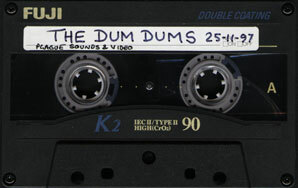 Shortly before the Dum Dums split in August 2001 they had been working on recording demos of songs that they'd written with a view to them going towards a second album. There were 3 main recording sessions in 2001; One in February where the band laid down 5 tracks, including 'Photographs' (which they had been playing live on the tour the previous November/December), another in April where they recorded 10 tracks and then another in June (shortly before going to Japan) where a further 4 tracks were recorded. In total 19 songs were written and then recorded and now that the website has been re-launched we plan to let you hear some of these songs. Not all of the tracks were finished, and some didn't come out sounding as they were planned, so it's doubtful that you'll ever hear all 19, but at least you get to hear some of them, right? We will be posting new tracks over the next few weeks - so make sure you check back to download the latest songs! The lines below separate the tracks recorded in the 3 different sessions during 2001 - Feb/April/June. To download the tracks, right click & choose 'save target as' etc. etc. 04. What Do I Want What I Haven't Got? People were telling me to get away from that 'far too young to be making out' stuff, teenage love and that, which was fair enough since by that time I had like been married for two years !! Recorded during the February 2001 session. Recorded during the April 2001 session. So instead, I will be so bold to say that I think this is one of, if not THE best songs the band ever wrote/performed. Despite the impaired vocal take on this demo recording of the track (Josh was suffering from severe hayfever when this was recorded in June 2001) the energy is amazing. Again, like so many others I'm left wishing I could hear a 'proper' recorded version of this song......enjoy. - James (webmaster). The following track are a mixture of demos of tracks the band recorded, songs that were never released and alternative versions of songs. (which sadly no longer exists). We had just recorded 'Everything' which we had talked about putting out a rough mix of as an indie single and needed something extra for the cd. 'Until my ship comes in' was one of the tracks we were so proud of at the time and it seemed therefore a good thing to do. I still think of this song as one of our finest moments.